Either you’ve got a professional career – or just a job. If you’ve got just a job – you probably will want to just pass on this post. If you’ve got a career – read on! Either you are treating your career seriously – or you are not. If I can use home ownership as a parallel to career ownership – which I plan on doing here I’d like to discuss home maintenance and improvements – or rather career improvements and maintenance. Back in the early 1980s when I was at Motorola I often heard about the ever-increasing-reduction of the half-life of an engineer’s education. I don’t recall the specific number used back then – but my take away was “Whoa Nelly” – that means they’ve got to keep-on keeping-on regarding their knowledge/skill base acquisition. So true for many careers – because the only constant now-a-days is constant change. According to my quick research – I first saw these kinds of stats back in the 1980s when I had to start in earnest with maintenance on my 5th house – I’d always had new or never stayed in one long enough to worry about this prior – one should plan on spending 1-3% of the purchase price or value of the home on annual maintenance. Maintenance on a home might include painting, replacement of roofing and siding, improving the landscaping, etc. Think curb appeal. If your house doubled in value then you should plan on doubling the investment required. If your house value has gone down recently as most have in this economy – I wouldn’t necessarily lower that maintenance estimate – but that’s just me. But it is a personal decision. To calculate the investments you might need regarding Career maintenance you might think of the original investments that it took to get you into your career. College costs, etc. Or think of your annual salary for your starting point. Is the 1-3% a good number for you? I don’t really know – but I think it is worth personal pondering. Have you thought about this in a while, or ever? If not – you may be late at starting – and hopefully “better late than never” is something to keep in mind to spur you into action. What are you reading to keep abreast with the current thinking and tools/techniques in your profession? What networking groups do you belong to – and even more importantly – are “involved with? Lurking in the corners in a session or online brings minimal returns. What professional groups do your belong to and attend their F2F and online gatherings? Something to ponder the “value proposition of” for each possibility – and then determine what to do to up your game. Today things are even more competitive. There is a glut in the housing market making it harder for those wanting/needing to sell than in recent years. There are people downsizing their life styles for a variety of reasons. And there are new homes coming into the market every day. Today things are very competitive in the Career market as well. People are coming back into the job market due to their reduced retirement savings. And there are new graduates coming into the market from colleges and universities. And there are a bunch of people without jobs – all competing for your position or your desired next job. Plus there are various right-sizing (OK, down-sizing) efforts going on and will continue for a while in many, many enterprises as the economy contracts. This is part of a continuous cycle, which if you are as old as I am (almost 57) you’ve seen this many times in your career. This was not unexpected – just as the recovery is not unexpected. It’s just a matter of when – or how soon. The returns for house maintenance just might be whether your house is saleable or not when you need it to be so. The returns for Career Maintenance just might be your continued employment where you are currently at or via obtaining that next position should you need to do so. 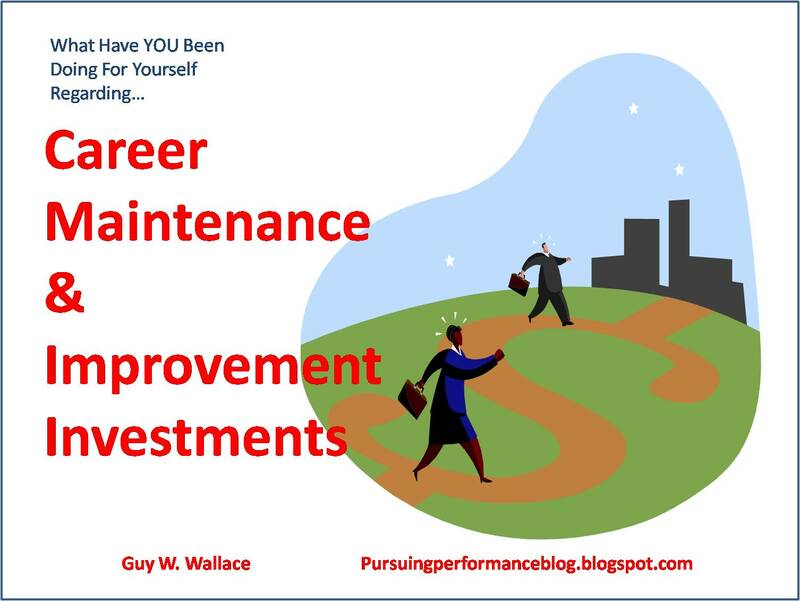 What is the dollar value of 1-3% maintenance of your Career? And how does that compare year in and year out for what you’ve really been investing? It’s not an expense – it’s an investment!!! It can lead to keeping your job/career when downsizing happens – if you are successful at translating new learning into improved performance – or all those learning were a waste of time and money. It can lead to increases in salary where you are at – or after a job hop. Just as many homeowners go beyond mere maintenance with their houses and get into improvements – one must think about that too regarding their careers. Some improvements are radical – making a one story 3 bedroom ranch into a two story 6 bedroom manse. Or, adding a pool and the empty lot next door for a putting green for you and/or a soccer field for the kids. Some improvements are minor in comparison. Some are painting projects. Others are kitchen improvements and bathroom improvements – which the home repair literature touts as those with the highest return rate. Putting a pool in will actually lead to a negative return – but if it’s not for the next owner and is for you – well, we all choose to invest in good times differently. Well, not really – unless enhancing your career and earning power makes you feel good. And just as home improvement efforts go from small to big so too with Career improvement efforts. 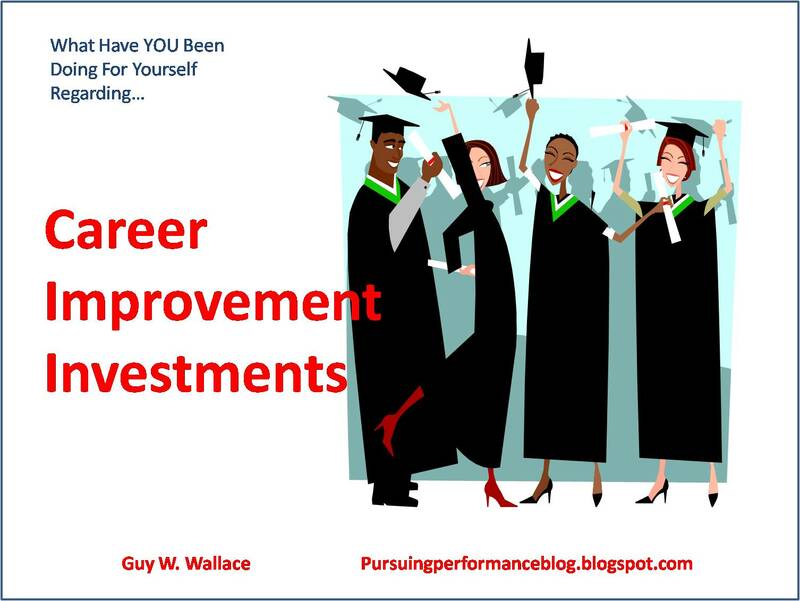 Small enhancements to your career might be just keeping up with your reading of career relevant books, articles, Blog postings, etc. Learning what’s new is a continuous battle/effort. For everything is changing, evolving. Constantly. What you know is right could now be wrong. Bloom’s Taxonomy is in question. Learning styles exist but should not be “designed for” according to the research. Designing for multi-generational differences is bogus too. And these things are still touted in what you might read – so a narrow set of reading sources just might lead you astray. Know your resources – and trust, but verify!!! Additional enhancements can come from increasing your involvement with your professional network and joining other networks. Yes, that is plural. I’ve got professional networks from the early 1980s from ISPI and some residual from prior involvement in ASTD and Lakewood Conferences. And I’ve got much newer networks from participation in LinkedIn, FaceBook and Twitter. And sometimes these overlap. But not always. What can these networks do for you before you are job searching? They can point you to what they are learning and their trusted/verified sources for what’s new, what’s up, and where is it all seemingly going? And then when does the course change – for that is a constant too. And you can keep track of, as “greybeards” like me have been doing for years now – that what’s old is new again. Always a fun sport when you’ve been there and done that a few times. My current favorite is: Web 2.0 changes everything. Until Web 3.0 and 4.0, etc. come around that is. It is a continuum of ever evolving “new things/stuff.” Hey – video is back! It was “the thing” in the late 1970s. Stories are back – and they were “the thing” way way back in the day – think: Socrates. Radical enhancements to your career could be learn something totally new and change professions. As some professional fields begin to disappear you’ve got to see that coming sooner rather than later – and be prepared both mentally and financially to “follow the buffalo.” Otherwise you and your tribe will starve. It is that big a deal. The returns for your investments are similar to those of Career maintenance. Giving some thought to the specifics of your context will give you your answers. As the various disruptions in your Career field – made possible by new IT technologies and other advances – occurs, your ability to first survive and then thrive is enabled or disabled by your thinking and your actions of the past, present and future. If you’ve not done much in the past – you are playing catch up. React accordingly. What’s in your plans? If you don’t have any – make some!